While late Apple cofounder Steve Jobs's office remains in situ at the company's Infinite Loop headquarters, a more impressive memorial may be in the works as current chief executive Tim Cook has indicated his desire to name all or part of the new spaceship campus after Jobs. 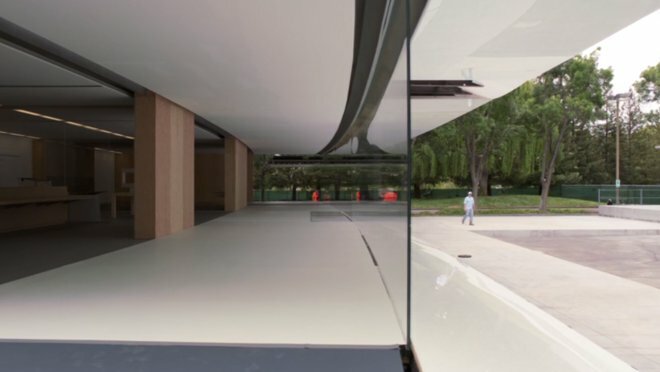 One of the life-size mockups Apple used in the design of its new campus. Jobs's family will have the final say on any such naming arrangement, Cook revealed during an interview with Fortune's Adam Lashinsky. It could include a specific facet of the building, or possibly the entire project. Jobs is known to have been obsessed over the design of the new campus in the years leading up to his death, and appeared personally in front of the Cupertino City Council to seek construction approval. "I think we have a shot at building the best office building in the world," Jobs said at the time, in what would turn out to be his final public appearance. Cook calls the new campus "the mother of all products," citing high-tech features like special apps that can direct employees who commute via car directly to open parking spaces. He believes that the office environment is of paramount importance to the culture of a company, panning the typically boring offices inhabited by workers in high-rise buildings. The office "shouldn't be a place that doesn't turn on your creative juices," he said. "I hate the word 'headquarters,'" Cook added. "There's real work going on here. It isn't overhead, and we're not bureaucrats." Among the features that Cook is looking forward to the most is the private 1,000-seat underground auditorium being constructed on the grounds. Much like the decision to abandon its keynote slot at the annual Macworld conference, moving events to the private auditorium will give Apple more control over its product release cycle. "No more scheduling months ahead of time around other people's schedules," he said. Even as construction is progressing quickly —AppleInsider's own aerial footage of the site shows the cafeteria section topped out —the company has yet to decide which groups will be relocated from Infinite Loop. One that seems sure to move is the design group headed by Jony Ive, which will reportedly occupy "a top-floor space of thirty thousand square feet, with Industrial Design and Human Interface together, sharing a view of what Apple refers to as the 'savanna' between the main building and the fitness center."